only and is not a substitute for clinical judgment. This document was reviewed by the Director of the Joint Trauma System, the Public Affairs Office, and the Operational Security Office at the U.S. Army Institute of Surgical Research and approved for unlimited public release as of 30 April 2013.
group was convened to address the lack of prehospital care documentation in the conflicts in Iraq and Afghanistan. At that point in time, there were over 30,000 casualties from these conflicts, but less than 10% of these casualties’ records had any documentation of the care that was provided before the casualty reached a medical treatment facility. Unit-level reporting formats were used in almost all cases of successful documentation. It was noted at the conference that, in many instances, the first responders providing care were not medical personnel. Documentation of care provided by non-medical first responders requires a format that they understand and can use effectively. (Butler 2010) The DD Form 1380 Field Medical Card that was in use by the DoD at the time was not believed by conference attendees to be optimally configured for documenting first responder care on the battlefield. Three possible choices for battlefield trauma care documentation were reviewed at the conference. One was the DoD paper form 1380. The second was the Battlefield Medical Information System—Tactical (BMIS-T)—a PDA device. Neither format was felt to sufficiently meet the needs of the prehospital providers in the tactical environment. A clear majority of the CoTCCC voting members selected Card 4 as the preferred version. This card was then forwarded to CoTCCC voting members for a “yes” or “no” vote, with the results as noted below. The lack of adequate documentation of prehospital care rendered to U.S. casualties is a clear obstacle to ongoing TCCC and JTS efforts to improve that care. “You can’t improve what you can’t measure, and you can’t measure without data.” (Eastridge 2011) Since 87% of combat fatalities occur in the prehospital phase in the continuum of care, (Eastridge 2012) documenting and analyzing what occurs in this phase of care is crucial. 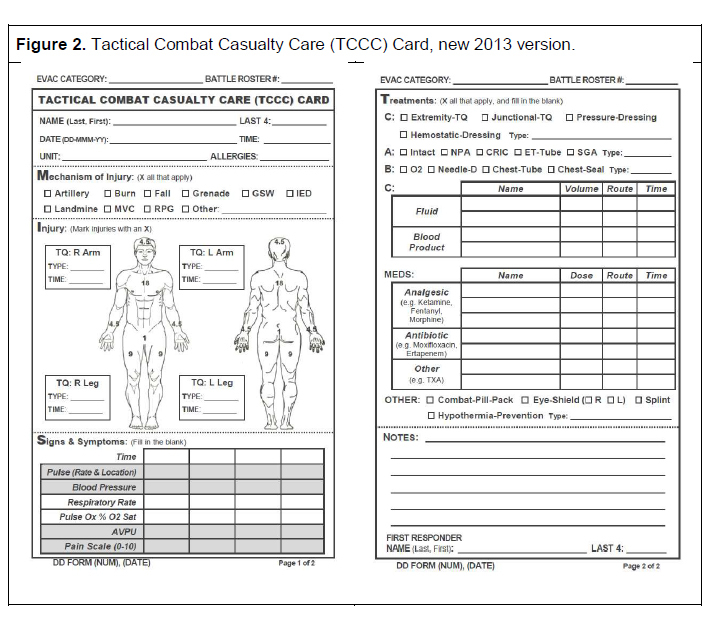 The TCCC casualty card (DA Form 7656) needs to be updated and designated as a Department of Defense document. The CoTCCC endorses the use of the newly developed proposed DD Form as shown in Figure 2 for this purpose. the casualty to the next level of care. casualty to the next level of care. information with the casualty to the next level of care. Vote: The proposed change noted above passed by the required 2/3 or greater majority of the CoTCCC voting members. should be provided monthly and should be tracked as a PI indicator. Future efforts to leverage technology and develop electronic methods of capturing prehospital medical care should be encouraged and funded. the Army All Army Activities Message Date Time Group 242018Z DEC 09. Documentation, Rapid Action Revision (RAR) Issue Date: 4 January 2010. Tactical Combat Casualty Care. J Trauma Acute Care Surg 2012;73:S395-S402. Caravalho J. OTSG Dismounted Complex Blast Injury Task Force; Final Report. Development, Training, and Evaluation priorities; 20 Dec 2012.
death on the battlefield. Arch Surg 2011; 146:1350–1358. Minimizing Preventable Fatalities; 6 August 2009.